The new Conservative majority government under Prime Minister Stephen Harper seems to be moving forward briskly with multiple policy reviews in areas relating to military and civilian space activities. There are at least three. 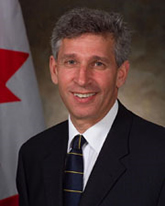 First up is a review of the 2008 Conservative Party Canada First Defence Strategy (CFDS) according to the May 29th, 2011 article on "David Pugliese's Defence Watch" titled "Robert Fonberg To Head Review of Canada First Defence Strategy? What Might Be Dumped from the CFDS?" The article states that Deputy Minister of National Defence, Robert Fonberg could be preparing to head a review of the CFDS, beginning at the end of June. The expected focus will be on how CFDS has not been funded appropriately until now and how the Department of National Defence (DND) should proceed in the future. As outlined in my January 16th, 2011 post "Canada's Military Space Policy: Part 4, Funding an Appropriate Force" the CFDS mandates the capability to undertake multiple missions, either separately or together plus the procurement of a variety of big ticket new equipment including transport aircraft, helicopters, fighter planes, at least one new icebreaker and other surface combat vessels. These purchases requires command, control and situational awareness capabilities of a type provided by satellites like RADARSAT, RADARSAT 2, the follow-on RADARSAT Constellation project and the DND Surveillance of Space (Sapphire) project, which is part of the Canadian Space Surveillance System (CSSS). Because of the large amounts of money involved (an estimated $490 billion CDN over the 20 year program) and the ambiguity of components of the plan, there has been quite a bit of internal lobbying from DND, the Canadian Space Agency (CSA) and others to add specific programs to the CFDS mix including additional fast response capabilities (such as unmanned aerial vehicles) and maybe even a micro-sat launch capability. 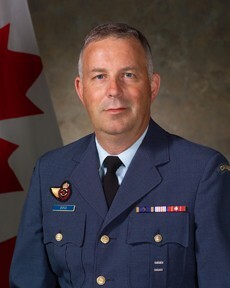 This seems to have been part of the rationale for the November 2010 announcement by Colonel André Dupuis, the Director of the DND Directorate of Space Development (DSpaceD) that DND was intending to release an "updated" but not substantially changed Canadian military space policy early in 2011 as discussed in the November 22nd, 2010 Spaceref.ca article "Canadian Military Space Policy to be Released in Early New Year." Of course, that review still hasn't been released and has likely been superseded by this new review. Hopefully the space component of the CFDS, which is arguably the least expensive and most useful bang for the buck will be retained once this new review has run it's course. The second, official review is the upcoming civilian/ military "aviation" review.as reported in the March 22nd, 2010 Spaceref.ca article "Harper Government to Review Aerospace Policy and Programs" which is likely going to be included as part of the upcoming Federal budget. This review would supersede the September 2008 long term space plan (LTSP) that Steve MacLean was tasked with when he became president of the CSA. 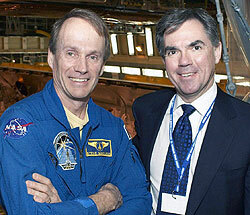 Steve MacLean & then Industry Minister Jim Prentice in March 2008. As discussed in my March 28th, 2011 blog post "The Difference Between Aviation and Space" there is much concern in the space systems industry over being lumped together with the larger "aerospace" industry which, in Canada at least, is mostly about airplanes and focused on different issues. But, as outlined in the March 2nd, 2011 Spaceref.ca article "Top Space Focused Companies Critical of Federal Research and Development Funding," four of Canada's ten largest space companies have been publicly critical of the federal governments implementation of research and development (R&D) funding as outlined in the governments Science and Technology strategy "Mobilizing Science and Technology to Canada's Advantage." So maybe this new aerospace review is timely, after all. Of course, the Federal science and technology strategy is the subject of another review, our third under discussion today which is review of Federal Support to Research and Development. The findings of this review are also expected to be released sometime over the next year. Normally after an election, there is a broad consensus on policy directions and initiative expected to be undertaken by the new government, but that doesn't seem to be what's happening this time. Perhaps, what we really need is to review all these reviews, in order to see how they fit together and what they're really being used for. Avoiding the Internet "Filter Bubble"
The Commercial Space blog is officially two years old on Sunday. Also a "commercial space" activity. 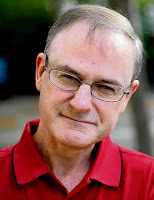 The first post, titled "About This Blog" was published on May 29th, 2009 and described an intent to concentrate on providing news and commentary on Canadian space focused industries , the partnerships developed to maintain and grow those industries and the politics surrounding those partnerships. Mostly, I did this because there seemed to be no other sources of information or traditional media outlets covering this area in any great detail. There wasn't, but I was also trapped inside my own personal and private "filter bubble" of personal preferences and self sorting tendencies that essentially limited my access to contrary information and knowledge outside my (then) immediate area of interest. These tendencies are especially strong among the general population in the area of media preference and are even used by web companies like Google and Yahoo to tailor their news and search results to our perceived personal tastes. 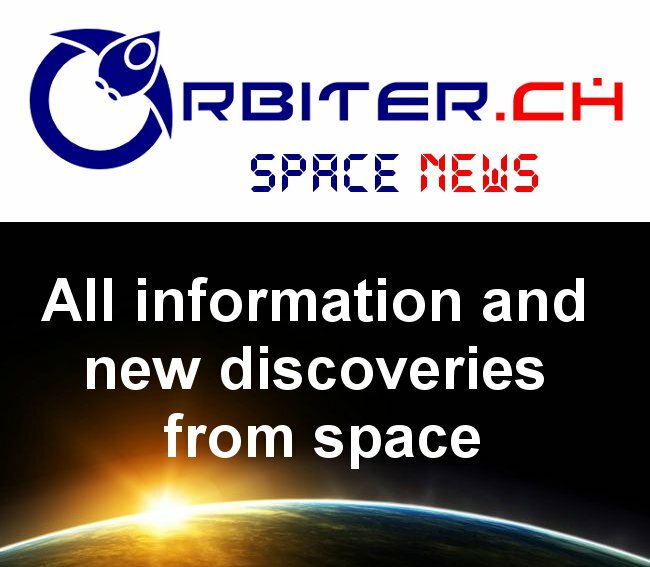 In essence, any two people looking for information about "commercial space activities" are likely to receive two different sets of links and background information, which makes it more and more difficult to agree on basic facts or debate public policy. 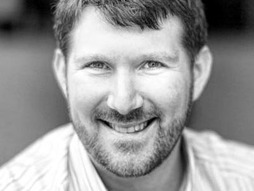 According to organizer and author Eli Pariser, seen below at a recent TED talk, this is "narrowing our worldview" and bad for democratic society. He's right, but for a bit more background information on this topic, it's certainly worthwhile to check out the search engine optimization entry in Wikipedia and then consider how powerful an advertising message would be if there was never any way to collect information that could contradict the initial advertizement. As it stands now, the only real way to avoid a filter bubble is to consciously seek out new opinions, sources of information and then develop a consistent context to tie together these disparate sources of "raw data" into repositories of useful, contextual information. Is there a greater role waiting for Canada in space? This is what I've been trying to do over the last two years. I can't do it all myself and continue to rely on others like Marc Boucher at Spaceref.com (who lets me write the "This Week in Space for Canada" columns), Elizabeth Howell (who once worked on the PARS3C blog and now contributes to the Ottawa Business Journal), Peter Rakobowchuk (who writes on Canadian space activities for the Canadian Press), Clark S. Lindsey over at Hobby Space (who sometimes exposes my writings to a wider, mostly US based audience), Kevin Shortt at the Canadian Space Society (CSS) and everyone associated with him plus pretty much everyone associated with the Canadian Space Commerce Association (CSCA). We need these people and others from the Canadian Space Agency (CSA) and commercial concerns like Telesat, MacDonald Dettwiler (MDA), and ComDev International along with political pundits, scientists, educators and advocates of all stripes to create and preserve the sort of "embedded ethics" that Eli Pariser feels are needed to provide information and access what is really happening in space for Canada these days. In the final analysis, it's up to the readers to decide if the 175 posts made on this blog over the last 24 months are a useful summary of Canadian space activities during that period. I intend to keep writing and hopefully people like you will keep reading and perhaps we'll even learn a few useful things as we go along. Maybe I'll even be able to continue making a few bucks on the side. Wish me luck. Joe Landon, the Managing Director of the Space Angels Network, promised me during a recent interview that he would have a deal to announce soon. Yesterday, one of Landon's member firms followed through on this earlier promise. As outlined in the May 23rd, 2011 Space Angels press release "Space Angels Network Member Announces Investment in Altius Space Machines" Space Angels Network member and managing member of the Orrery Group, LLC, entrepreneur Richard M. Davis has led a seed‐stage investment in Altius Space Machines (ASM) of Louisville, Colorado. ASM builds a unique "sticky boom" electrostatic adhesion technology using thin plastic pads with embedded electrodes to create a "static cling" forces that enables sticking to almost any surface. ASM has recently been testing the technology under zero gravity conditions and expects to develop applications related to on-orbit servicing and space docking missions. Seen below is a recent sample test of the adhesion technology using a three pound, non-ferromagnetic copper ball. The Space Angels Network describes itself as "a professionally managed national network of accredited investors focused on aerospace-related opportunities" but until this announcement had not completed a financing deal. According to Landon, several of the member companies had made independent investments in aerospace related opportunities over the last few years and are well versed in the area but have been focused on providing members with access to connections, trading information and facilitating investments, rather than closing specific deals. Founding members of the organization include Ester Dyson from EDventure Holdings, Stephen Fleming from the Atlanta Technology Angels, David S. Rose from the New York Angels and Ed Tuck from the Falcon Fund. Organization sponsors include marketing company Brand Evolve, accounting firm Goodman and Company (which is now part of the larger Dixon Hughes Goodman LLP) and law firm Morrison Foerster. Space Angels founder Burton Lee spoke at the Canadian Space Commerce Association (CSCA) 2008 Accelerating Space conference on the topic of angel financing in January 2008. 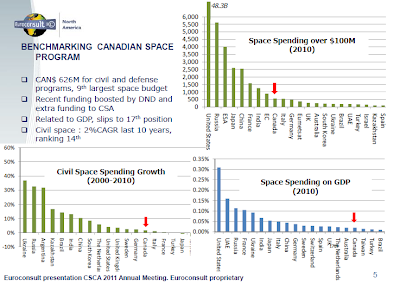 Labels: Canadian Space Commerce Association, Commercial Space Activities, Funding "rocket science"
Nothing to See Here! Move Along Now! It's worth noting that the recent news reports relating to the Radarsat Constellation (RCM) program, such as the May 20th, 2011 Canadian Press article "MDA signs $35.9M RADARSAT contract extension with Canadian Space Agency," aren't really going to tell us anything new unless we decide to look closely. Canadian actor Leslie Neilsen in the Naked Gun movies, encouraging us to move along now. And part of what this close look will illuminate is the parceling out of long-term, big dollar contracts into small, easily digestible, bite sized slices which cover only short periods of limited work. This adds paperwork and press releases, but also lengthens lead times and normally drives up the total costs of a project as teams break apart, reform, attempt to justify themselves or move on to other things and generally kill time between funding infusions. It's just the way the industry works, both here, in the US, Europe and pretty much everywhere else. For example, according to the May 22nd, 2011 SatNews Daily article "MDA + CSA... Continue the Cause," BC based MacDonald Dettwiler (MDA), the prime contractor for the RCM program" has been working on this contract under an Authorization To Proceed, since March 17, 2010. The value of the latest amendments totals $35.9 Million (CAD) and brings the contract value for the Design Phase to $123 Million (CAD)." 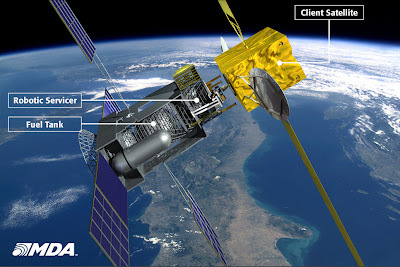 MacDonald, Dettwiler and Associates Ltd., (TSX:MDA), a provider of essential information solutions, announced today that the Canadian Space Agency has authorized the Company to start the design phase (Phase C) of the RADARSAT Constellation Mission. 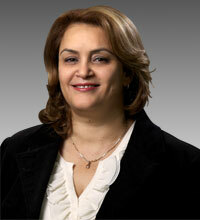 This authorization is limited to $11.8 million (CAD) and is expected to be completed by June 11, 2010. 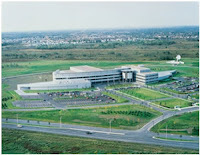 The Company successfully completed work on Phase B in February 2010. This phase was originally announced in November 2008. So the contract really goes back to November 2008, at least according to this press release. Is it possible that the actual program goes further back in time (perhaps even to the very start of phase A)? It's possible that the real contract could even precede the 2010 Federal budget announcement that RCM would be funded to completion (as covered in the March 4th, 2010 Spaceref.ca article "RADARSAT Constellation Mission get Funding in Budget") and go back to the 2005 Federal budget allocation of $7 million CDN to MDA for "conceptual design work" as outlined in the March 14, 2006 MDA press release titled "MDA Starts Work On Next-Generation Satellite Constellation." Or it could go further back. 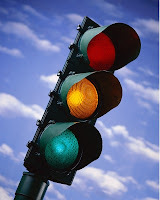 After awhile, it gets hard to track these things and at least a part of that problem has to do with the concept behind the phrase "authorization to proceed." It's essentially one of those confusing legal terms which helps to provide corporate lawyers with job security by replacing the time honored tradition of a verbal agreement and handshakes with lots and lots of paperwork intended to provide contractors and suppliers with the confidence needed to move forward in the absence of defined terms, payment schedules, milestones and other items that you would normally need when doing this sort of thing. But paperwork coupled with ambiguity generally doesn't make people comfortable. Because of this, every once in awhile, a new document is created to codify anything defined since the last contract, a press release is issued and a bit more money is allocated in order to give everyone sufficient incentive to continue moving the process slowly forward. Eventually, something might even get completed (possibly) and another press release could be issued (usually). For it's part, MDA has recently objected to Canadian Space Agency (CSA) efforts to parcel out RCM contract awards in small slices covering only short periods by arguing that it lengthens lead times and drives up total costs as mentioned in the May 4th, 2011 Space News article "MDA Corp. Sets Internal Deadline for Reaching Acquisition Decision." And to be fair, the CSA is bound by Federal governments announcements of long-term funding for expensive projects like RCM and spread out over the long term, but lacks access to any real allocated funds beyond the current fiscal year. This places the CSA in the positions of being the bad guys, who must stretch out the payment schedule in order to maintain the cash flow and balance the books. No doubt it's not a position that the CSA would prefer to be in. As for the press releases and the accompanying news reports based on the press releases? There's nothing to them. Move along now. 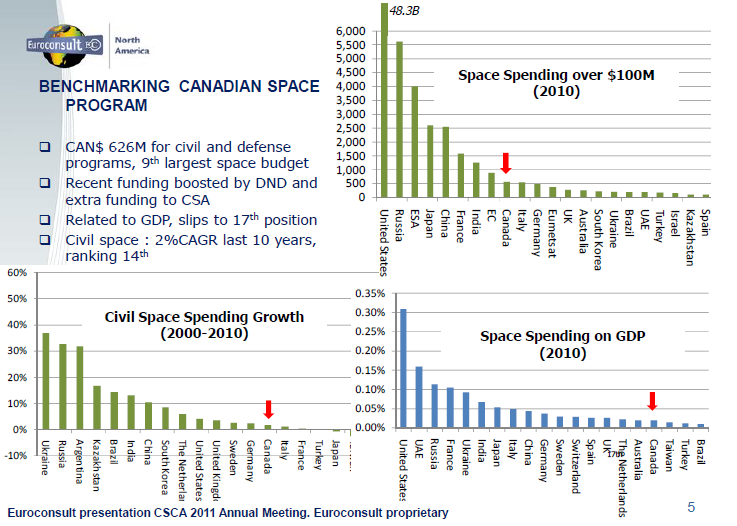 The State of the Cdn Space Sector. The Canadian Space Agency (CSA) and most of the rest of those in the know call it the space systems industry and it isn't yet quite as big as the Canadian aerospace industry, which the Aerospace Industries Association of Canada (AIAC) categorizes as generating $22 billion CDN in revenue in FY2009 (according to the October 2010 report titled "The Strategic and Economic Impact of the Canadian Aerospace Industry"). But it's still a pretty good size. 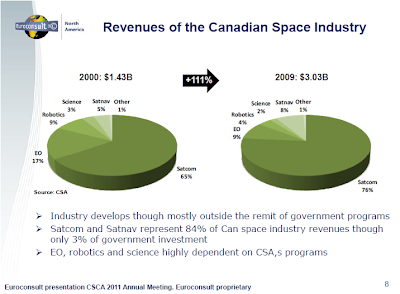 The 140 companies and organizations listed in the Canadian Space Directory generated $3.1 billion CDN in revenue in 2009 according to the 2009 State of the Canadian Space Sector Report (2009 CSSR). And the industry is growing. According to the report, revenues increased by 8% over 2008 to $3.025 billion, surpassing the $3 billion mark for the first time and workforce growth continued on a strong upward trend. The Canadian space sector presently employs "7564 people, of which 3770 are highly qualified professionals" according to the report. ... the (current) report covers 2009, the first full year of the great recession, and the growth of the overall Canadian economy for that year was essentially zero (at least according to the Statistics Canada data collected on the Trading Economics website). (Given that) the strength of our commercial space industry seems impressive. Satellite communications is the sector with the most commercial activity at $2.326 billion CDN for 2009 according to the 2009 CSSR. The satellite sector represents 77% of total space sector revenue in 2009. But to go any deeper into the industry as it presently stands, you need to look at a presentation titled "The Canadian Space Sector in the International Landscape" which Euroconsult, North America President Steve Bochinger created to present during the 2011 Canadian Space Commerce Association (CSCA) conference and general meeting on March 18th, 2011. 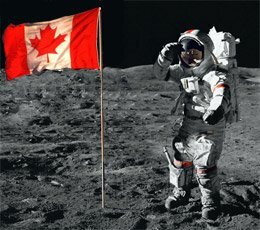 A short snapshot of the Canadian space program C/O Euroconsult, North America. Specific mission requirements, such as Radarsat Constellation, M3MSat, Cassiope, NEOSSAT and others. Earth climate data collection, environmental assessments and resource inventories. Technology development and commercialization as mandated by Canadian S&T strategy in documents like the Mobilizing Science and Technology to Canada's Advantage (May 2007) and the Mobilizing Science and Technology to Canada's Advantage Progress Report (June 2009). Science, exploration, robotics and the development of Moon and Mars rovers. The private sector description, pretty much parallels the 2009 CSSR with slightly over $3 billion CDN in revenue, weighted heavily on the satellite communications sector but with the added comment that the industry mostly develops outside of government investment. Which means that there is not a lot of overlap between the $626 million CDN government funded sector and the $3+ billion CDN private sector. According to Bochinger, rocket launchers are not an area of investment although there are ongoing discussions around the development of an indigenous small satellite launcher to facilitate science and provide military situational awareness capabilities. He also believes that the difficulty in formulating a national space policy (as discussed in my three part post "Two Billion Dollars for the Canadian Space Agency") highlights uncertain domestic governance and leadership. Canadian space industry revenues from 2000 - 2009. C/O Euroconsult, North America. Now that we know where the Canadian space systems industry stands, it's worthwhile taking a look at the leading companies in the sector, where they sells products and where the sector is going. Those discussions will be the subjects of future posts. According to the May 12th, 2011 BBC News article "Wikileaks cables show race to carve up Arctic," secret US embassy cables released by Wikileaks "show nations are racing to "carve up" Arctic resources, oil, gas and even rubies, as the ice retreats." According to the article, the cables were released as foreign ministers from the eight Arctic Council member states (Russia, the United States, Canada, Denmark, Norway, Finland, Sweden and Iceland) met last week. This seems more than normally bad for Canada given that the May 12th, 20111 CBC News article "US dismisses Harper's Arctic talk," states that the Wikileaks cables also indicated that the US government doesn't take Arctic sovereignty pronouncements by the Stephen Harper government seriously. As outlined in my four part series "Canada's Military Space Policy" the Harper government has substantially revised Canadian defense policy under the 2008 Canada First Defence Strategy (CFDS) to focus more on Arctic sovereignty through the development of new satellite situational awareness capabilities and has also publicly stated that it intends to increase Department of National Defense (DND) funding from $18 billion in 2007-2008 to over $30 billion by 2027-2028 for a total of $490 billion over the 20 year period covered by the strategy, but has not yet moved forward with funding. As well, an announced 2011 update of the existing Canadian military space policy (as discussed in my November 22nd, 2010 post "Media Notes from the 2010 Canadian Space Summit") has also not yet occurred as announced and is unlikely to do so soon. The 2011 John H. Chapman Award of Excellence was presented to Dr. Henry Buijs on May 12th, 2011 in Ottawa for his contribution to "major space missions that have had and will continue to have a tremendous impact on the understanding of the Earth's atmosphere," according to Canadian Space Agency (CSA) President Steve MacLean. 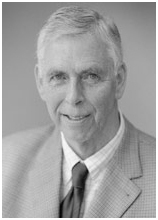 Dr. Buijs is one of the original founders of Bomem (a high-technology company now part of the ABB group) and used the company to help establish fourier transform spectroscopy as a core Canadian expertise for atmospheric monitoring using satellites. According to Buijs (as quoted in the May 13th, 2011 CBC News article "Canadian space technology inventor honoured"), the secret to his success wasn't simply the original invention; it's that his company made tools specifically for heavy industry which meant they had to be rugged, durable, capable of surviving in a range of extremes and were therefore imminently suitable for space environments. The technology Buijs developed has been used on the SCISAT-1 and Japanese Greenhouse Gases Observing Satellite (IBUKI/ GOSAT) and is scheduled for use with the upcoming Mars Trace Gas Mission. The John H. Chapman Award is normally presented to CSA subcontractors who have contributed to the advancement of the Canadian space program and a list of previous recipients is available here. The Canadian Space Society (CSS) has issued it's call for papers for the 2011 Canadian Space Summit, which will be held in Calgary, Alberta from November 16th - 18th, according to this announcement on the CSS website. The theme of the conference is "Big Data from Space and Earth" which seems appropriate since the phrase "big data" refers to data-sets that grow so large that they become awkward to work with. This is essentially what is happening with our current focus on geomatics, Earth imaging and space situational awareness, which requires large amounts of data collected from ground and space based instrumentation in order to develop a useful understanding of any environment. For ideas on how these items relate to current space activities, it's worthwhile checking out my March 2nd, 2011 article in Spaceref.ca titled "Growth in Space Utilization to Benefit Canadians." It's interesting to note that two of the nine announced teams for the 2011 University Rover Challenge, organized by the US based Mars Society, are Canadian based. The University of Waterloo Mars Rover Team and the York University Rover Team will be joining three teams from Poland and four American teams to compete for "cash prizes, a trip to present at the annual International Mars Society Convention, and a year’s worth of bragging rights" at the Mars Desert Research Station in Hanksville, Utah from June 2nd - 4th. 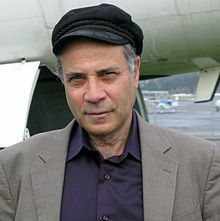 Even more interesting is the May 14th, 2011 Wall Street Journal article by Mars Society President Robert Zubrin which outlines a plan to go to Mars before the end of the decade by using hardware expected to be fielded by rocket manufacturer Space Exploration Technologies (Space-X) within the next few years. Total cost is "half the mission cost currently required to launch a shuttle flight." If we believe Zubrin and Space-X, the cost of space exploration is finally starting to go down. Speaking of which, as the curtain on US space shuttle program also slowly goes down, it's worth noting that most of our past, present and potential future CSA astronauts have stepped up their efforts to remind Canadians that "there is still a bright future for them among the stars," at least according to the May 12th, 2011 Vancouver Sun story "Next generation of Canada's astronauts still see future in the stars." The article quotes new CSA astronaut Jeremy Hansen as being "adamant" that the end of the Space Shuttle program doesn't mean Canadian astronauts should temper their ambitions of exploring space. He's right of course, but the question on everyone lips isn't whether there will be any more Canadian astronauts, especially since Vision 2000 executive VP Stephanie Anevich announced at the last Canadian Space Commerce Association (CSCA) meeting that she was one of thirteen Canadian's who have already signed up for suborbital astronaut trips aboard the Virgin Galactic (VG) Space Ship Two. The real question is whether there will be any more CSA government supported astronauts after Chris Hadfield returns from his expected long duration stay aboard the International Space Station (ISS) in 2012-2013.The CSA has so far announced no trips after Hadfield's and seems unlikely to do so soon. 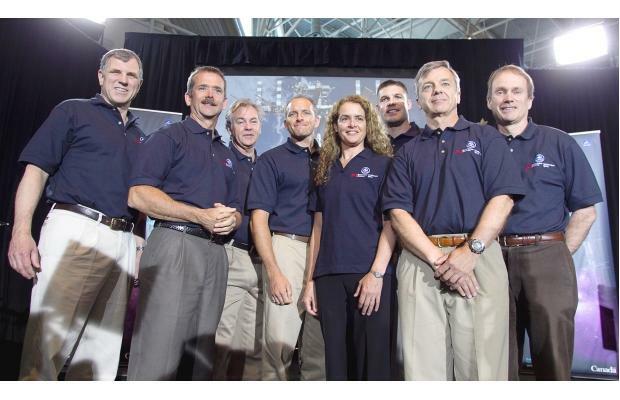 CSA astronauts Daffyd Williams, Chris Hadfield, Bjarni Tryggvason, David Saint-Jacques, Julie Payette, Jeremy Hansen, Robert Thirsk, and Steve Maclean take part in the opening of The Living in Space exhibit at the Canadian Aviation and Space Museum in Ottawa. Liberal MP Marc Garneau on CTV. And finally, as one of the few current or ex-CSA astronauts not retired or opening new museum exhibits these days, federal MP Marc Garneau is focused on the new position of interim Liberal leadership, which he self-announced for last week in an effort to replace retired leader Michael Ignatieff and help rebuild his devastated party (which went from 77 to 34 seats held in the latest federal election). 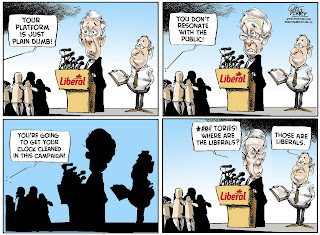 According to the May 13th, 2011 CTV.ca article "Marc Garneau makes his case for becoming interim Liberal leader" Garneau feels that his previous experiences as an astronaut, head of the CSA for four years and as a liberal MP proves that he can run a "tight, disciplined team that can deliver on projects." Traditionally, the job of an interim leader is to build consensus, write down the party debts from the last election and generally rebuild the party infrastructure in anticipation of the next permanent leader. MacDonald Dettwiler (MDA) CEO Daniel Friedmann has announced that his firm will either buy a space company with US roots or else return to shareholders the $793 million CDN acquired through the January, 2011 sale of the MDA property-information business. Friedmann made the comments during MDA's first quarter 2011 results conference call and Annual General Meeting on May 3rd, 2011 which is archived and available for review on the MDA website. The announcement is in contrast to 2008, when the company attempted to sell it's space division to US based Alliant Techsystems (ATK) while retaining the property information business. As outlined by the April 10th, 2010 CBC News article "Federal government blocks sale of MDA space division" that proposal fell afoul of the federal government, which eventually blocked the sale. This time it's the property information business that's been sold (as outlined in the January 4th, 2011 MDA press release "MDA closes sale of U.K. and North American Property Information Business") with the space division remaining in Canada but with MDA executives now looking for another company to acquire to help provide the space business with a solid entry point into the US market. ... Friedmann made clear the company is searching for a large target, and not a strap-on acquisition. Key characteristics of the target company would be a solid entry into the U.S. government market, and a presence in markets where MDA has expertise that could be transferred to a U.S. operation for access to government business. Consistent readers of this blog know that MDA has been repositioning itself into a full service satellite contractor (as per my November 1st, 2009 post "Canadian Component Builders "Moving Up the Food Chain" to Build Complete Satellites") while also developing a totally new business wrapped around on-orbit refueling and commercial satellite repairs (as per my April 3rd, 2011th article "A Short Primer for On-Orbit Satellite Servicing"). 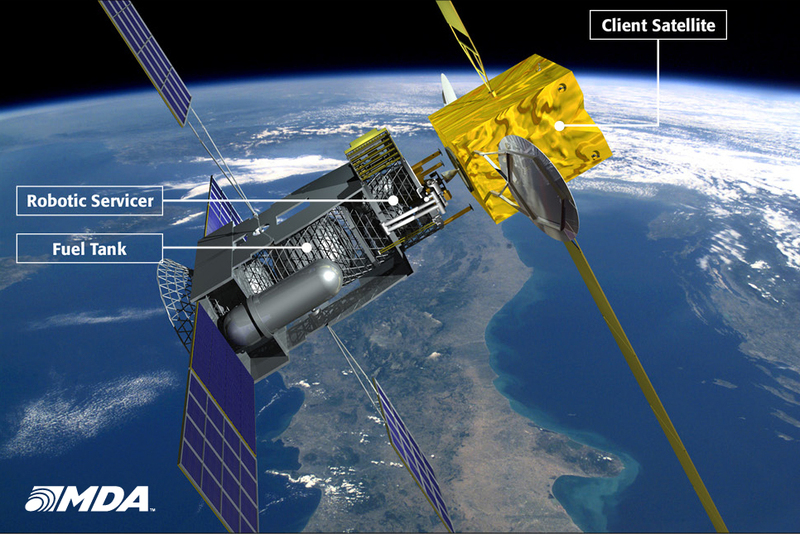 The MDA on-orbit satellite servicing system, as announced in March 2011. A company with that many space focused interests requires access to international, and especially US markets to prosper. 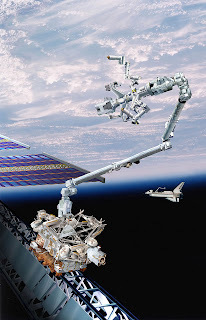 Canadarm 2, part of the ISS Mobile Servicing System. 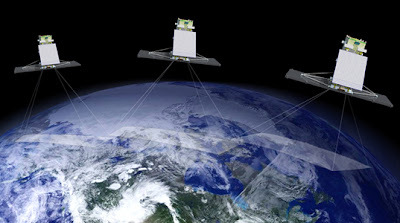 MDA presently has contracts to act as prime contractor for a variety of telecommunication satellites plus Canada's next-generation Radarsat Constellation (RCM) Earth observation system and ongoing maintenance contracts for the iconic Canadian CanadArms in use aboard the US space shuttles and on the International Space Station (ISS). MDA has also recently objected to Canadian Space Agency (CSA) efforts to parcel out RCM contract awards in small slices covering only short periods by arguing that it lengthens lead times and drives up total costs. MDA executives might just have a point regarding their CSA issues although that point and two and a half bucks is likely only really useful for a cup of coffee. This will remain true at least until some decisions start getting made at the political level (hello twelve to eighteen month "aerospace review"). But then again, what sort of an "aerospace review" is going to pass judgement on a company making the sort of positive market moves that MDA is in the midst of doing? Of course, the "proof is in the pudding" as my grandparents used to say. Let's wait to see what MDA actually ends up doing with the money before passing any sort of judgement on their actions. Why is there this rush now to make an acquisition based on setting a deadline to buy a US based space enterprise? Any US based space enterprise that is to be acquired will have to be non-strategic. Otherwise the US Department of State will block that sale just as the Government of Canada did with the MDA space assets in 2008. This begs the larger question as to the direction and purpose of a Canadian Space Agency which has not, in its entire existence, had a cogent space plan and continues to spend much of its budget on astronaut training. How does the astronaut program provide benefit to Canadians in the development of space technology and in creating jobs in its space industry other than providing work for civil servants in Quebec? The concepts used in satellite servicing market have been around for well over thirty years or more and have cost versus technology option/adoption issues as well as timeliness. Europe already has at least two SAT servicing companies (UK based-Orbital Satellite Services and Greco-German company Kosmas Georing Services come to mind) and far bigger budgets so looking to bootstrap Canada into that business is a costly proposition without good partners that can provide a fully integrated servicing capability. Three recent announcements highlight the growing capabilities of the still young, but increasingly vibrant, and fast growing space tourism industry. Space Adventures modified Soyuz TMA capsule. They also serve as an introduction to the next Canadian Space Commerce Association (CSCA) meeting on Thursday, May 12th, when Stephanie Anevich, the executive vice-president of Vision 2000 Travel and part of the accredited sales associate (ASA) team for the Virgin Galactic (VG) Space Ship Two suborbital space plane, will talk about some of the more "out of this world" services her firm provides. For more information or to attend the presentation, I'd encourage people to check out the CSCA website. As for those other three recent announcements, the first was last week, when Virginia based Space Adventures Ltd. issued a statement that it intends to offer trips around the Moon using "modified Russian Soyuz capsules" beginning as early as 2015, at least according to the May 8th, 2011 eWeek.com article "Space Adventures Plans Modified Soyuz Spacecraft for Commercial Flights." A May 7th, 2011 follow-on story posted on the PC World Geektech blog titled "Take a Trip Around the Moon for Only 150 Million Dollars" stated that the first ticket for the trip had already been sold and more were available. 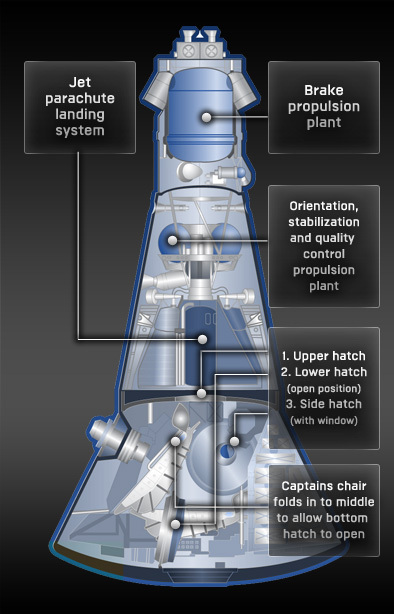 The Almaz capsule, based on a Russian TKS. Space Adventures has already launched seven astronaut/ space tourists (including Canadian Guy Laliberté) into orbit for periods of between nine and fifteen days. That's only two less astronauts than the Canadian Space Agency (CSA) although some of the official Canadian astronauts have gone up more than once and for longer periods. Of the space tourists, only Charles Simonyi has gone into orbit twice, at least so far. The second announcement was of the recent acquisition of four Russian TKS space capsules (intended to be reusable) and two complete, surplus Russian Almaz space stations by Isle of Man based company Excalibur Almaz. According to the May 4th, 2011 article "A look at the Isle of Man's space stations" on the Isle of Man.com website, the equipment will be refurbished and eventually launched into orbit as part of the company's long-term business plan to "become the world leader in providing reliable, affordable and routine access to space for exploration and tourism." The team at Scaled Composites and Virgin Galactic passed a milestone today with the first feathered flight of Space Ship Two. The flight is the first test of the re-entry configuration for the spaceship and comes as Scaled is in the middle of a busy month of flight testing for the spacecraft. The re-entry test, undertaken with the wings tilted at a 65% angle upwards towards the fuselage (a configuration called "feathered") is designed to be simpler and less difficult than flying the spaceship straight back into the atmosphere as was done by the X-15 back in the 1960s. This latest test indicates that the craft is nearing the end of testing and will soon be ready to perform suborbital commercial flights. 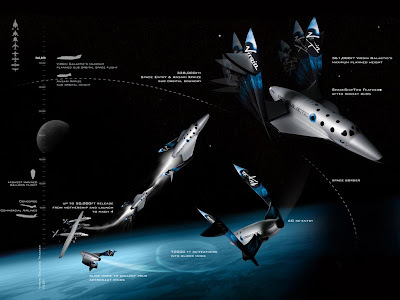 Virgin Galactic Space Ship Two mission profile including "feathered" flight. Taken together, these three announcements cannot be easily dismissed or ignored by national space agencies like the CSA who have, until recently, possessed an exclusive monopoly on manned space travel. Unfortunately for them, each of these announcements originate from strong, well funded companies with multi-million dollar war chests, existing hardware and exceptional business track records. According to Stephanie Anevich, thirteen Canadians have already paid deposits on trips into space through Vision 2000 aboard Space Ship Two and there are also inquiries from scientists looking for appropriate platforms for suborbital microgravity research. 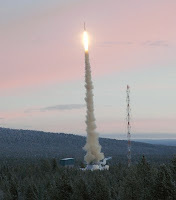 Sounding rocket launch in 2005. Obsolete? That's quite a bit more upcoming flights than the CSA can boast about and the inquiries relating to microgravity research also provides strong evidence that Space Ship Two will likely soon dominate the market presently controlled by suborbital sounding rockets. This is something I first suggested in my January 11th, 2011 post "The Shrinking Market for Sounding Rockets." 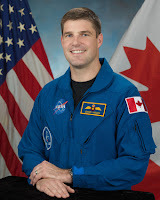 But of course, the official Canadian astronauts are still going into orbit, spending time on the International Space Station (ISS), performing experiments and expected to undergo serious training as a preliminary to each flight so they can't really be compared to simple, paying "passengers" expected to endure only a few minutes of weightlessness before safely returning to Earth. However, there is only one CSA astronaut presently scheduled for an orbital mission over the next few years and Space Adventures plans to send more than one person just to the Moon in the same period and far more to the ISS. So while the professional astronaut corps is dwindling, the number of astronaut "tourists" is set to explode over the next few years. We live in interesting times and anyone who'd like to learn a little more about those times should come to the CSCA meeting on May 12th. According to the May 3rd, 2011 Montreal Gazette article "Star Liberal MP Squeezes in," one of the liberal party star candidates and Canada's first man in space, Marc Garneau is slightly leading in his home riding of Westmount-Ville-Marie and has likely won re-election. Liberal problems according to Greg Perry. But the race was close. The article even has Garneau conceding at one point and stating that " the Liberals were powerless against "the large, cataclysmic tectonic shift" that happened in Canadian politics Monday night." He might have been right concerning the bigger picture, but as reported by the May 3rd, 2011 Globe and Mail, the final election results for the Westmount-Ville-Marie riding show Garneau elected with 37.2%/ 15,361 votes against NDP candidate Joanne Corbeil with 35.6%/ 14,703 votes, Conservative candidate Neil Drabkin with 17.5%/ 7,216 votes and Bloc Québécois candidate Véronique Roy with 5.5%/ 2,290 votes. It's good for the space systems industry that Garneau personally was re-elected, no matter what his political affiliation. Last Wednesday at a Canadian Advanced Technology Association (CATA) teleforum conference call focused on innovation, entrepreneurship and public policy, Garneau even responded to a question on the use of flow-through tax credits to spur growth in the clean energy, resources, health, biosciences, and digital technology sectors by indicating that these sorts of tax credits would also be useful to grow the space systems sector. The use of flow-through tax credits (originally designed for the mining and resource industry as outlined in my June 20th, 2010 post "Mining as a Model for the Commercial Space Industry") has been discussed off and on among commercial space experts for quite awhile and it's about time for this to finally gain traction in the wider public policy sphere. Options and policies like this will need to be discussed among the surviving liberal leaders (and Garneau is certainly one of those now) if they ever expect to govern again. D. Sellah, the new NDP MP for St. Bruno/St. Hubert. This might even be something for NDP leader Jack Layton to look at since the Canadian Auto Workers, Canada's largest private sector union also represents aerospace employees at Boeing Canada (Local 2169), Bombardier/ de Havilland (Local 112), Cascade Aerospace (Local 114), CMC Electronics, Magellan Aerospace/ Bristol (Local 3005) and Pratt and Whitney Canada (Local 510). Of course, the overall election results show the Conservative Party under Stephen Harper with 167 seats and a majority government, the New Democratic Party under Jack Layton with 102 seats and official opposition status, the Liberal Party under Michael Ignatieff reduced to a rump of 34 seats and the Bloc Québécois under Gilles Duceppe essentially wiped out as a party with only four seats remaining. 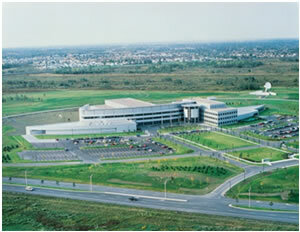 John H Chapman Space Centre, also in St. Hubert. As a result of the election, it is expected that the new government will move quickly to re-introduce the FY 2011 federal budget, originally tabled in the House of Commons on March 22nd, but not adopted before the dissolution of Parliament on March 26, 2011. This existing federal budget includes a proposal for a twelve to eighteen month review of the combined "aerospace industry" which will include the Canadian space systems industry and the Canadian Space Agency (CSA) and will also supersede previous reviews as outlined in my March 18th, 2011 post "The Difference Between "Aviation" and "Space"." In essence, the new review means that the 2008 long term space plan (LTSP), undertaken by CSA President Steve MacLean as part of a mandate from then Industry Minister Jim Prentice in this September 2nd, 2008 speech, is finally and officially dead. It will be interesting to see what the new conservative majority government comes up with to replace the LTSP. Perhaps the space systems industry should also start lobbying the incoming Harper government about flow-through tax credits. The elections Canada's web-site (http://enr.elections.ca/ElectoralDistricts_e.aspx?type=2&criteria=marc%20garneau) generally confirms those preliminary results. It says that Marc Garneau won Westmount-Ville Marie, with 15,346 votes (37.2%), ahead of the NDP candidate who received 14,704. Editors Note: Send your questions, queries, concerns and comments to mr.chuck.black@gmail.com and I'll make sure they get posted. NASA as "The Gang that Couldn't Shoot Straight"
According to the April 29th, 2011 Space.com article "Shuttle Launch Fever: NASA's VIP Guest list for Endeavors Last Hurrah" about 700,000 people, including US President Barack Obama and his family, parked themselves at various locations up, down and around the Kennedy Space Center on Friday to watch the space shuttle Endeavor remain perfectly stationary instead of blasting off to the International Space Station (ISS) for the second last mission of the US space shuttle fleet. US space shuttle Endeavor on the launch pad. Photo C/O of "The Space Shuttle is waiting." Initial news reports such as the April 29th, 2011 Spaceref.ca article "NASA Scrubs Space Shuttle Endeavour Launch at Least 72 Hours" suggested only short launch delays, but by Sunday follow-on reports such as the May 1st, 2011 SpaceRef article "Space Shuttle Endeavour Launch Delayed Again" indicated far longer delays stretching out at least into the following week. 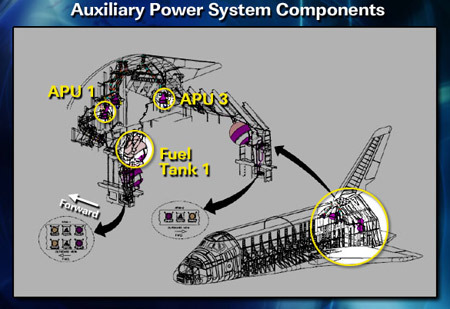 As of Sunday night, the problem has been tracked to something called a load control assembly (LCA) switch box which transfers power between multiple auxiliary power units (APU) on the shuttle. 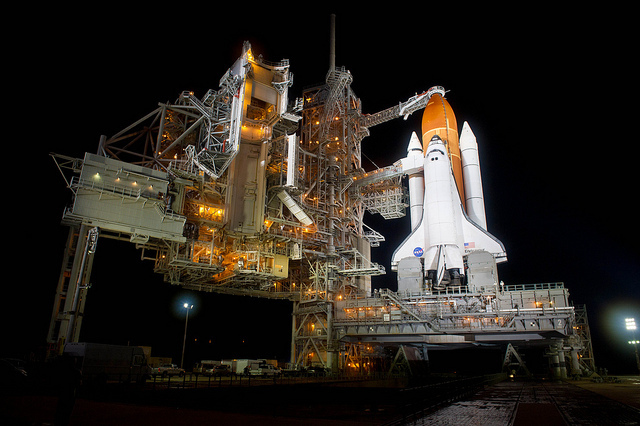 The LCA is expected to need to be removed in order to further troubleshoot the problem according to this April 29th, 2011 post on the National Space Society blog. Of course, launch delays seem to be an inevitability with the space shuttle. According to the August 7th, 2007 CBS News article "For Space Shuttle, Delays Are Typical" approximately 40% of space shuttle launches are delayed for one reason or another and that 40% rate is "not so bad," according to the expert cited in the article. Hopefully this success rate is better than the punctuality of the US train service between major American cities. 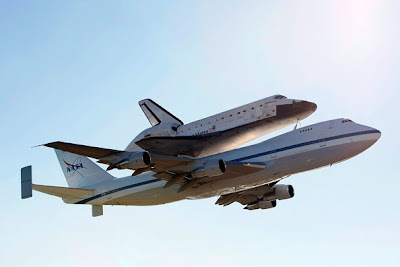 As for the 700,000 tourists in Florida, including the US first family and others who had mostly made the trip to see the shuttle actually do something, it's reasonable to say that the trip was a bit of a disappointment. Shuttle Endeavor atop modified 747 transport in December 2008. Canadian's who didn't get to see the launch included Canadian ambassador to the US Gary Doer, the Lieutenant Governor of Ontario David Charles Onley, plus Canadian Space Agency (CSA) President Steve MacLean, Vice President Chummer Farina and CSA Director General Space Technologies Gilles Leclerc. The Canadian's attended to mark the "Canadarm’s 89th mission since it first flew on Shuttle Columbia for STS-2 in 1981" according to the April 20th, 2011 press release "Final Flight of the Space Shuttle Endeavour: Canada's Contribution" on the CSA website. 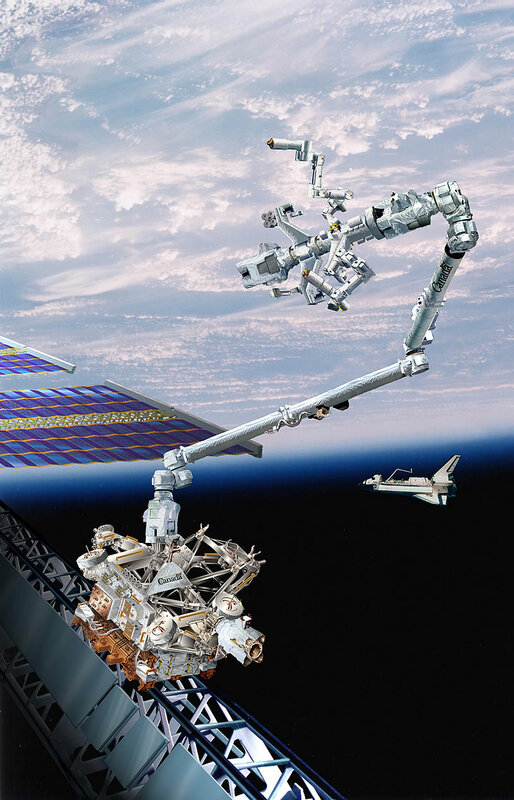 Endeavor's Canadarm is also expected to end up in a Canadian museum according to the April 12th, 2011 CBC News article "Endeavors Canadarm coming home." Most of the tourists who expected to watch the shuttle liftoff are slowly beginning to make their way back home and that's just how the ball bounces during these last waning days of the space shuttle program. It wasn't always like this, of course. The early Shuttle missions - satellite deployments, retrievals and repair - are missions that could never be approved in today's risk averse culture (and some of which were banned following the Challenger accident). The operations cost of the Shuttle system, devoid of space tugs and orbital maneuvering vehicles, soared along with the machine's flights. But on missions flying Spacelab modules and Spacehab units, the orbiter came close to achieving its storied promise as a space-going truck. Of course, that was before the loss of shuttles Challenger (in 1986) and Columbia (in 2003) locked the program into a growing risk adverse culture focused on shuttle crew "safety" and maintaining NASA jobs under the logical fallacy that, the more people you have that studying things closely, the safer those things being studied are going to end up. After the loss of the Challenger, the August 12th, 1989 New Scientist article "Odds on for a second shuttle disaster" predicted another shuttle disaster within ten years. This seems to have been an accurate prediction of the Columbia loss so there are certainly good reasons for appropriate caution and due-diligence with our remaining shuttle fleet during their final few voyages. But this also suggests that the shuttles are dangerous, finicky to fly ships which is a point that has generally been conceded by all concerned and is the major reason why the remaining shuttles are being retired. And while it's certainly for the best if the shuttle program winds slowly down in a whimper of diminishing interest as launch delays pile up (at least when compared to the explosive bang of one final catastrophe), it would also have been nice for the final few missions to go as planned just to show how well everything sometimes did work. The history of the space shuttle is yet to be written, but it doesn't seem possible that this narrative will age well or grow into our collective consciousness in the same way as our first great space race which culminated in the 1969 Apollo Moon mission. It probably won't even compare to what is likely going to happen over the next few years when the commercial space industry finally takes off. It's sort of like looking at "The Godfather" (a 1972 American crime film based on the novel of the same name by Mario Puzo directed by Francis Ford Coppola) and then taking in another early 1970's crime movie contemporary such as "The Gang that Couldn't Shoot Straight." You just knew which one was going to be remembered.